The Drop Port is a great feature for benchrest shooters. You can run a bolt without an ejector, yet your cartridge will extract smoothly and reliably each time you pull the bolt back. Stiller’s Precision Firearms pioneered the Drop Port design, and Jerry Stiller offers this as a popular option with his Cobra, Viper, Python, D-Back, and Diamondback actions. The Drop Port is amazing in its simplicity (watch video below). As you pull the bolt rearwards, the fired case slides downward into a funnel. As it tilts nose-down, the case rotates free of the six-o’clock extractor, falls nose first down the funnel, and finally exits through a hole in the bottom of the stock. Gravity does all the work. Until recently, if you wanted a Drop Port, your only option was to purchase a Stiller action or engineer a conversion yourself. Now the owners of Kelbly Panda actions can enjoy drop-port functionality via a conversion performed by S&S Precision Rifles in Texas. The folks at S&S will mill a slot in the bottom of your action, and then install a drop funnel in your stock. The conversion work is done so well you’d think the Pandas were originally made as Drop Ports by Kelbly. Drop Port conversions will be available for popular small match cartridges including 22 PPC, 6 PPC, 6mmBR, 6BRX, 6 Dasher, 6.5 Grendel, and 30 BR (plus other wildcats in the BR family). In the video above, you can watch S&S Precision convert a Stolle Panda action to a Drop Port, and then see how the converted Panda functions. The rifle is a 30BR owned by FORUM member Truckincars, who also created the video. 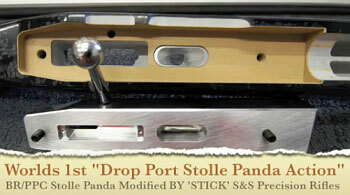 Share the post "Stolle Panda Drop Port Conversion by S&S Precision Rifles"
Since Jerry Stiller patented the Drop Port, I assume this is licensed? The first Panda drop port conversions were made years ago in Finland. The gunsmith has made his own drop port actions since early 90s and converted other actions too.